Background: Marginal ulceration (MU) is a recognized complication of Roux-en-Y gastric bypass (RYGB) surgery. was a retrospective study of 749 patients undergoing RYGB over a ten-year period with at least one year of follow-up. 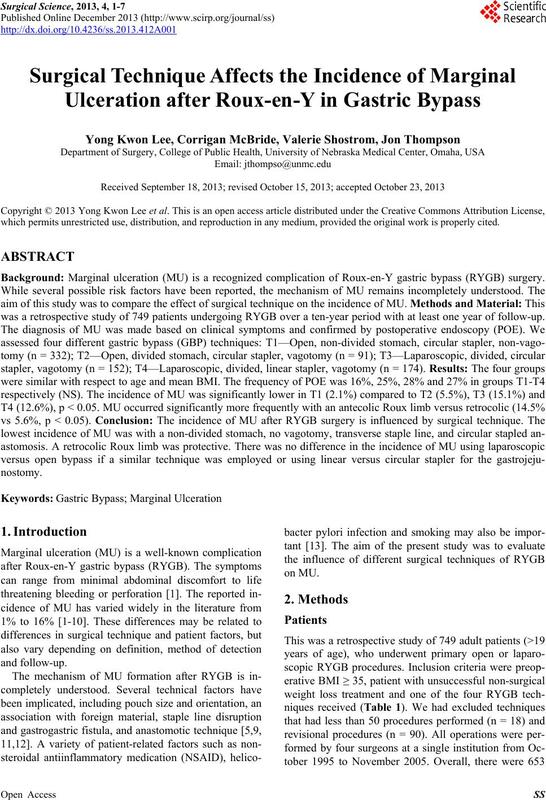 Y. K. LEE ET AL. Table 1. Comparison of surgical techniques. mean BMI was 51.5 with a range from 32 - 88 kg/m2. The following variables were collected and analyzed. was compared using the Kaplan and Meier log rank test. gastric pouch and secured with a 3-0 Prolene purse string. tal mattresses of 3-0 silk. with horizontal mattresses of 3-0 silk. stomach transversely 4 cm. This divided the vagus nerve. limb was brought in an antecolic or retrocolic fashion. tion just below the first branch of the left gastric artery. 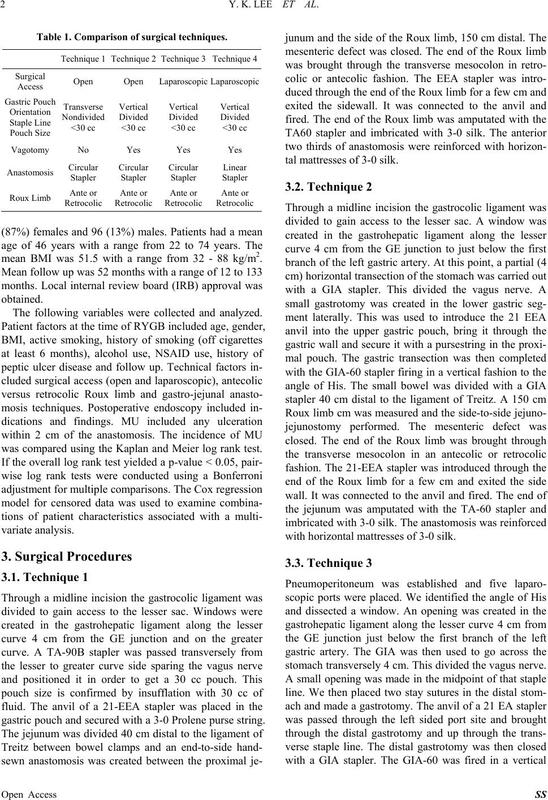 esophagus and across the gastrojejunal anastomosis. The four patient groups were similar in age and BMI. Overall, POE was performed in 166 (22%) patients. Table 2. Comparison of clinical characteristi cs. *p < 0.05 vs other; #p < 0.05 vs T3. Table 3. Incidence of marginal ulceration and endoscopy. *p < 0.05 vs T2, T3, T4; #p < 0.05 vs T3, T4. Table 4. Indications for postoperative endoscopy. Table 5. Results of univariate analysis. Table 6. Results of multivariate analysis. with a retrocolic limb compared to T4 (33%). *p < 0.05 vs antecolic. was also similar in the four groups. Technique 1 are not clear. This was an open technique. suggest that surgical access is not an important issue. tribute significantly to preventing formation of MU. 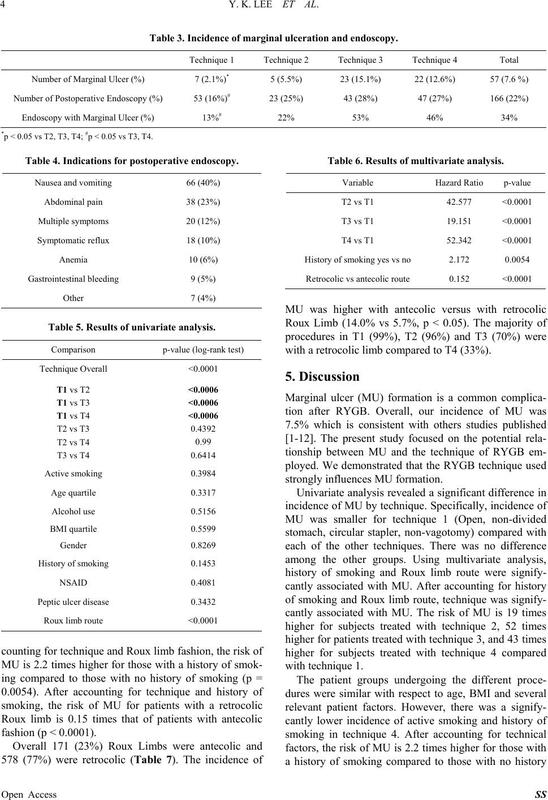 non-divided stomach increased the incidence of MU. would argue against this point. The vagus nerve was not divided in technique 1.
cess for intractable MU . Technique 1 included a circular stapled anastomosis. cluding hand sewn vs. circular stapled  and linear vs.
with the 21-mm vs 25-mm circular stapler, however. and potential ischemia at the anastomosis. Taylor et al. 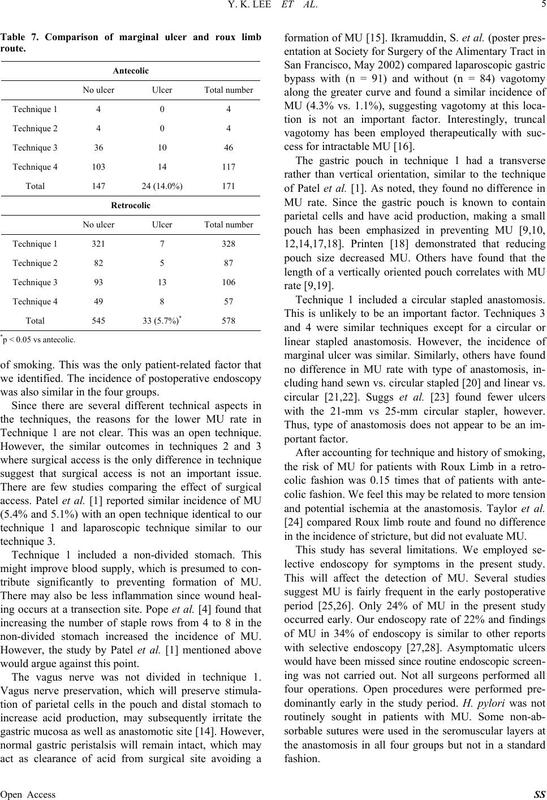 in the incidence of stricture, but did not evaluate MU. 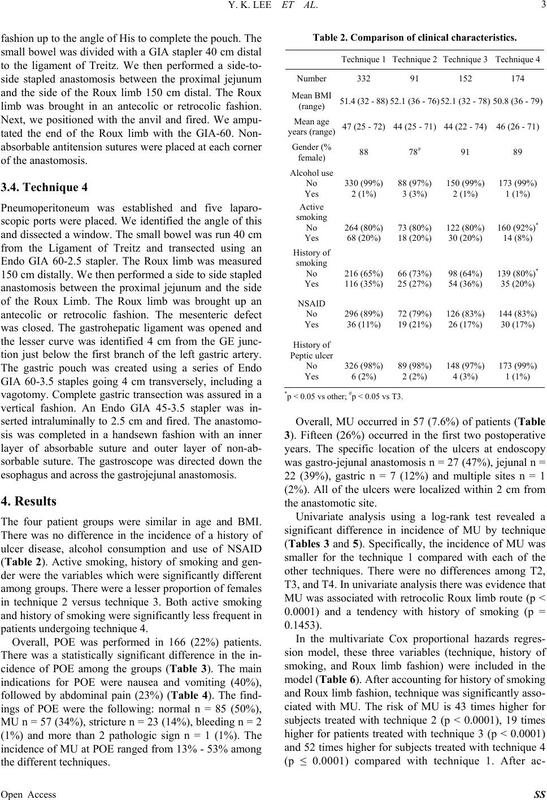 lective endoscopy for symptoms in the present study. sus open bypass if a similar technique was employed. No. 3, 2009, pp. 317-322. L. D. MacLean, B. M. Rhode, C. Nohr, S. Katz and A. P.
Vol. 12, No. 1, 2002, pp. 30-33. B. C. Sacks, S.G. Mattar, F.G. Qureshi, G.M. Eid, J.L. Collins, E.J. Barinas-Mitchell, P.R. Schauer and R.C. Diseases, Vol. 2, No. 1, 2006, pp. 11-16. Diseases, Vol. 2, No. 4, 2006, pp. 455-459.
lated Diseases, Vol. 2, No. 4, 2006, pp. 460-463. No. 5, 1998, pp. 505-516.
ceration,” Surgery for Obesity and Related Diseases, Vol. 3, No. 6, 2007, pp. 619-622. Vol. 16, No. 6, 2006, pp. 735-739. Obesity Surgery, Vol. 15, No. 6, 2005, pp. 771-777.
ful?” Obesity Surgery, Vol. 14, No. 5, 2004, pp. 575-576.
rican Surgeon, Vol. 78, No. 6, 2012, pp. 663-668. E. E. Mason, J. R. Munns, G. P. Kealey, R. Wangler, W.
Surgery, Vol. 131, No. 2, 1976, pp. 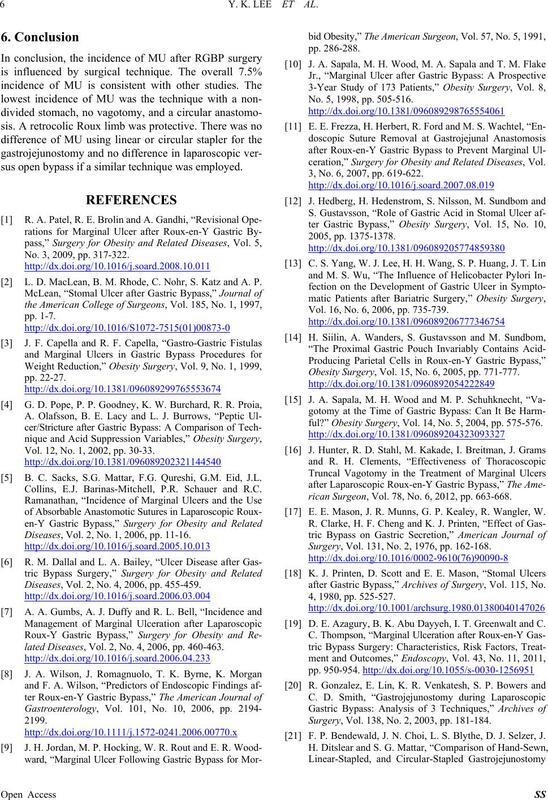 162-168.
after Gastric Bypass,” Archives of Surgery, Vol. 115, No. 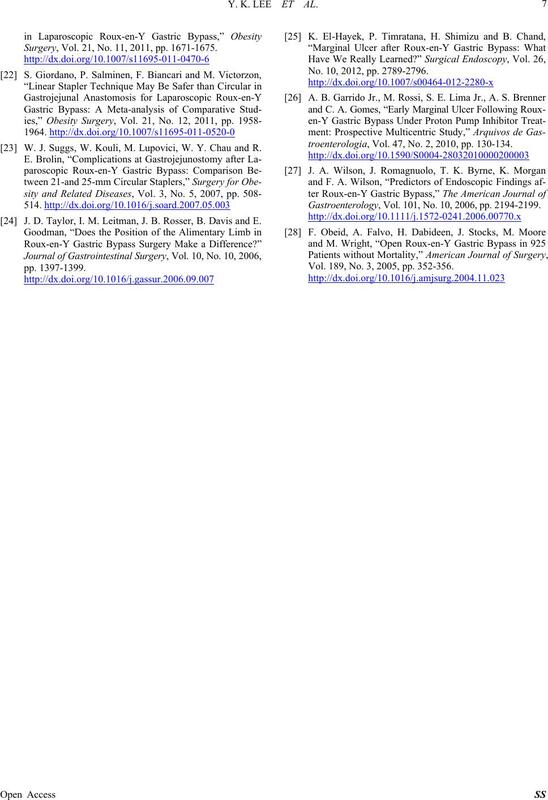 D. E. Azagury, B. K. Abu Dayyeh, I. T. Greenwalt and C.
Surgery, Vol. 138, No. 2, 2003, pp. 181-184. F. P. Bendewald, J. N. Choi, L. S. Blythe, D. J. Selzer, J. Surgery, Vol. 21, No. 11, 2011, pp. 1671-1675. W. J. Suggs, W. Kouli, M. Lupovici, W. Y. Chau and R.
 J. D. Taylor, I. M. Leitman, J. B. Rosser, B. Davis and E.
No. 10, 2012, pp. 2789-2796.
troenterologia, Vol. 47, No. 2, 2010, pp. 130-134. Gastroenterolo g y, Vol. 101, No. 10, 2006, pp. 2194-2199. Vol. 189, No. 3, 2005, pp. 352-356.